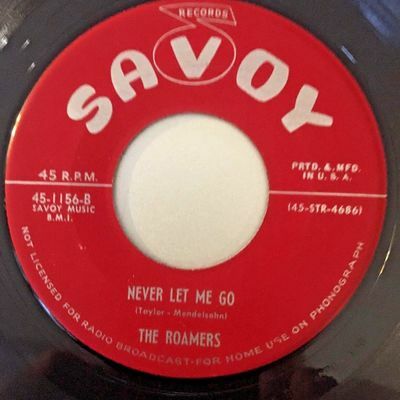 The record for your consideration is the Roamers "Never Let Me Go" /"Chop Chop Ching a Ling." Savoy 1156. Record is visually E+. Excellent shine. Record looks unplayed with no surface visible surface wear. Plays fantastic on our record player with no background noise. See scans for label condition. All records are guaranteed to be in the condition as listed to the very best of my ability. Everyone grades differently, but if you are not happy, you can return it for 14 days for a full refund. If any problems, please email us. Please ask any questions and we'll answer them as quickly as possible. U.S. buyers pay $4.00 S&H. Foreign buyers please wait for invoice as shipping costs will be higher. We do combine shipping for up to 4 records! Look forward to sharing our collection with you! Payment by PayPal only. Thanks!